At around noon yesterday, I went outside and walked down the street. Both my street and the main street (Prince Edward Road West) have no parking. Nevertheless, the pedestrian sidewalks were lined with cars that had newspaper logos on the side. 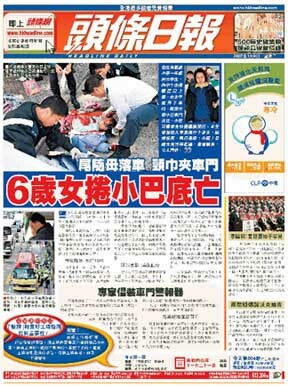 Later on, I would learn that there was a traffic accident earlier in which a 6-year-old girl was killed. 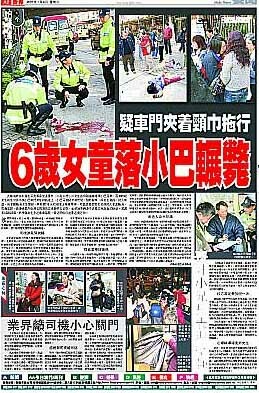 Here are the various reports in the local newspapers. The point of interest is the divergent descriptions of what occurred at the critical moment. Was it the down jacket or the pink scarf? Or the generic 'clothing'? By the time that I got to the scene, everything had been taken away and the roadway had been washed down. 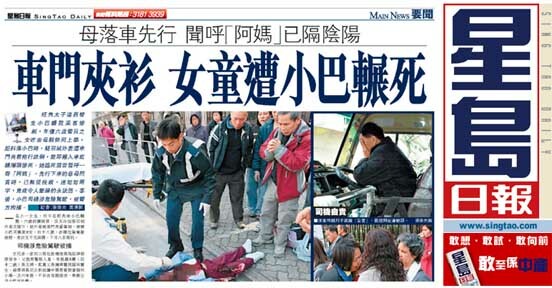 [WARNING: There are some graphic photographs that reflect the various newspaper cultures. At least half the population in Hong Kong have seen these photographs already (note: I calculated the number by adding the circulations of the newspapers and assume two readers per copy, and the answer is more than 4 million versus a population of 7 million. Besides, anyone who walked past a newsstand or went into a convenience store would have seen the front page photographs too even if they don't buy any newspapers.). 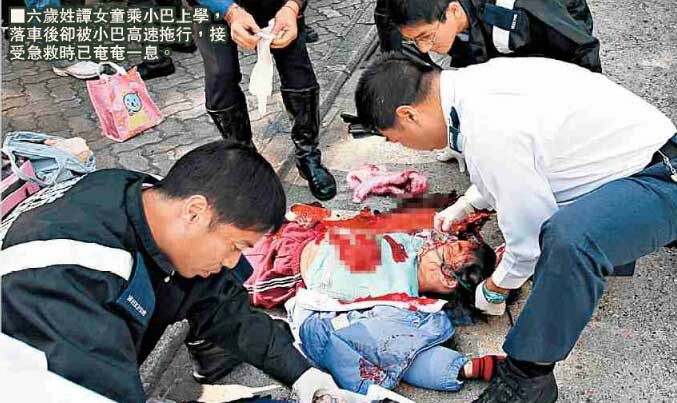 (SCMP) Schoolgirl killed in minibus horror. By Norma Connolly, Anita Lam and Danny Mok. January 9, 2007. A six-year-old schoolgirl was killed in front of her mother yesterday after her coat was caught in the door of a minibus that drove off and dragged her for 12 metres. 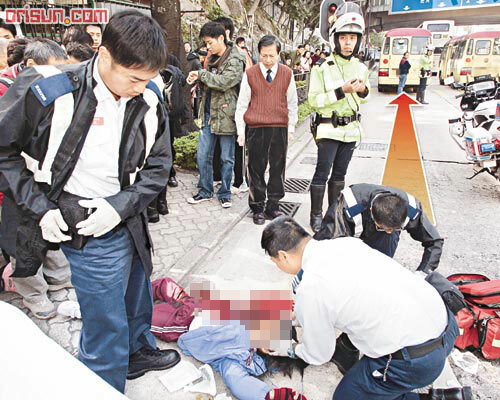 The girl suffered severe head injuries after she was caught under the bus as she got off in Prince Edward Road, Kowloon City. Police said the child and her mother, 42, were on their way to the Heep Woh Primary School, which she attended in the afternoons, when they got off the bus near Embankment Road about noon. "The girl followed her mother out of the bus. Her overcoat got trapped between the door and the vehicle. The bus moved off and she was pulled down to the ground and her head was run over by the near-side ," Vincent Wong Kwok-yan, of Kowloon West traffic unit, said. "I don't think the driver knew. 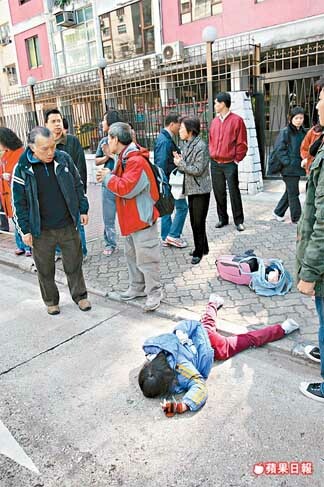 Her mother chased after the bus and hit it and then the driver stopped." Mr Wong said it appeared the driver pulled off as the child was disembarking and failed to check whether she had cleared the door. 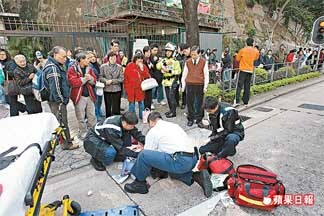 The girl was pronounced dead at Kwong Wah Hospital at 12.30pm. 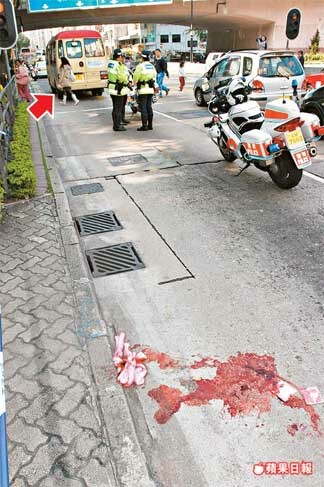 The driver, surnamed Wong, 48, was arrested for dangerous driving causing death. 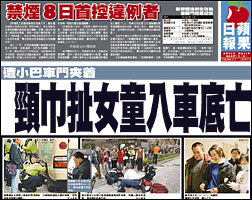 He was released on HK$5,000 police bail and ordered to report back on February 8. (The Standard) Schoolgirl, 6, dies in minibus tragedy. By Carol Chung. January 9, 2007. 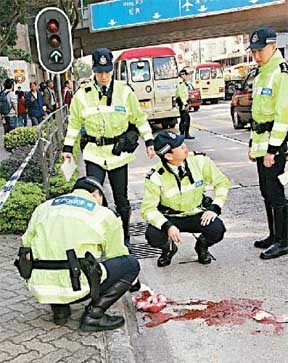 A six-year-old girl was killed after being dragged for 50 meters under a minibus after she left the vehicle in Kowloon City. The 48-year-old minibus driver was arrested in connection with the death. The arrest was made after a passenger said he saw the girl's clothing had been caught in the vehicle's door, heightening suspicion that the door was closed too hastily. The male driver, who tested negative for alcohol, was later released on bail of HK$5,000 and ordered to report back to the police in a month. The accident happened at about noon Monday as the minibus, traveling along Prince Edward Road West, stopped near Embankment Road for passengers to alight. Tam Yi-kwan, who was being escorted to school by her mother, reportedly had her clothing caught in the door as she left the vehicle. 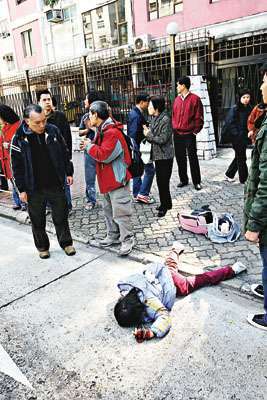 She fell, and was dragged along the road for about 50 meters before being run over, sustaining serious head injuries. 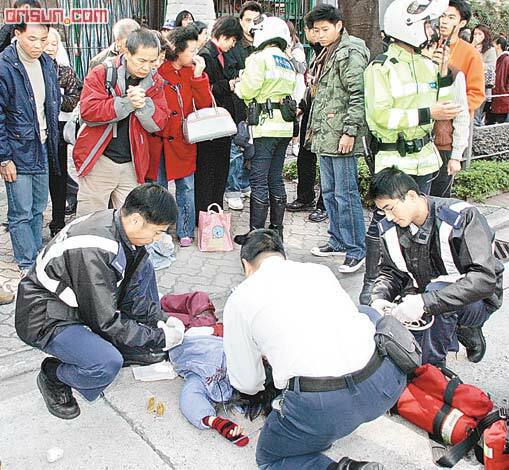 She was taken to Kwong Wah Hospital where she was certified dead. 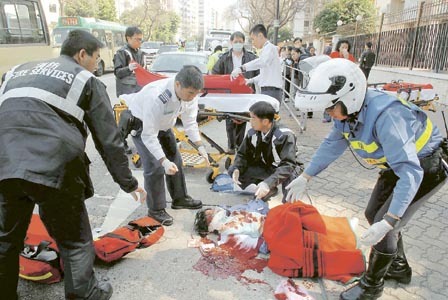 The girl's mother said she saw her daughter - a Primary One pupil at Heep Woh Primary School in Kowloon City - running a few steps alongside the moving minibus before falling and the vehicle running her over. The tragedy occurred at noon. In the company of her mother, Tam wore her school uniform and carried a pink backpack to take the Yau Tong-Prince Edward MTR Station minibus. 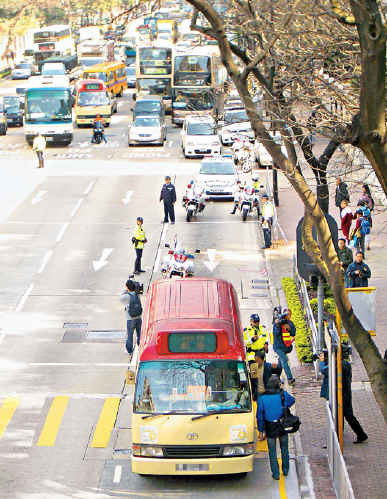 When the minibus reached the Embankment Road intersection with Prince Edward Road West, mother and daughter got off. According to information, Tam's mother went first and the daughter followed. When the minibus drove away, the girl suddenly "fell down" on the ground and was subsequently swept underneath the minibus. The mother was stunned by the shocking sight and did not know what to do. At the time, the driver in the BMW behind the minibus saw someone underneath the minibus and honked the car horn to get the minibus driver to stop. 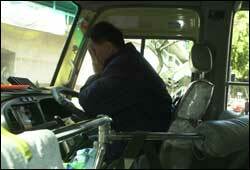 But the minibus driver did not know that an accident had occurred and continued to drive for 15 meters. He only stopped when many pedestrians shouted at them. The minibus arrived at Prince Edward Road West Number 195 across Embankment Road at 12:05pm. According to a male passenger, Tam's mother carried her daughter's school bag on her bag, a paper bag in one hand and a lunch kit in the other hand. She paid first and then got off the minibus onto the pedestrian sidewalk. Tam followed her. But when the minibus started to move, Tam suddenly fell into the road and yelled "Mom!" The passenger sensed that the left rear wheel had just ran over the girl and so he immediately yelled out to the minibus driver: "Someone has been hit! Stop the minibus!" By the time the driver braked, the minibus had already traveled 15 meters. 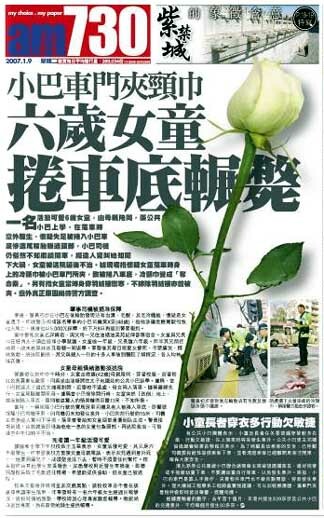 According to information, mother and daughter got on the minibus at Kwun Tong. Customarily, they get off at a point just past the railroad overpass. But yesterday, they wanted to go shop at the mall and therefore got off before the railroad pass. At the traffic light/pedestrian crosswalk just before the railroad overpass, Tam's mother told the minibus driver that she wanted to get off and the minibus stopped. According to information at the scene, someone was talking on mobile telephone at the time. The girl got off on her own. According to Tam's mother, when she got on the pedestrian sidewalk, she heard a terrible scream of "Mommy" and when she turned around, her daughter was swept underneath the minibus. At the same time, the female driver in the trailing car thought that the left of the minibus seemed to have rolled over someone. So she immediately sounded alarm by honking. The passengers also realized that something was wrong and banged on the side of the minibus and yelled to get the unwary minibus driver to stop. But by that time, the bus had already traveled 15 meters. At around noon, the minibus arrived at Prince Edward Road West across Embankment Road. Tam's mother indicated that she wanted to get off. The bus then stopped on the slow lane. She paid first and got off. Tam followed. It is suspected that someone was in a hurry to get going and took off before the girl moved away from the minibus. It is suspected that the clothing on the girl got caught in the door, so that she fell, got swept underneath the car and her head was rolled over by the left rear wheel of the minibus. At the time, Tam's mother heard her daughter scream "Mom! ", turned around, saw her daughter in a pool of blood and the minibus was driving away. She moved forward and pounded on the side of the bus. At the same time, a female driver in a BMW behind the minibus also observed what happened and honked the car horn. The minibus passengers then called to the minibus driver to stop, but the bus had already gone 15 meters already. When Tam Yi-kwan goes to school, she usually only wears a school jacket and sports clothing. Yesterday, she told her mother that she wanted to wear the "pretty clothing." So her mother put a down jacket on her. Mother and daughter took the minibus from Yau Tong to Mong Kok. At around noon, the minibus arrived at Prince Edward Road West near Embankment Road. Mother and daughter got out and intended to produced to Grand Century Place to have lunch. According to eyewitnesses, the minibus stopped by the curbside. Tam's mother got off first while holding the daughter's school bag. The girl followed closely. Just as the girl's feet touched ground, the minibus closed its door and moved movement. The girl yelled out "Mommy!" It is believed that the down jacket was caught in the doorway. 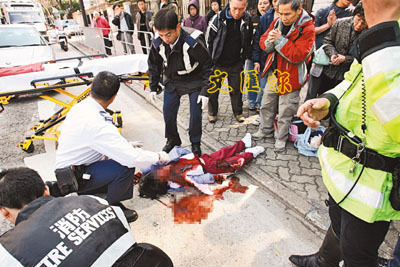 The girl was dragged several meters and then underneath the minibus. The left rear car wheel then rolled over her head. Tam's mother pounded on the side of the minibus when she realized what was happening. A female driver in a BMW behind the minibus witnessed the accident and honked her horn too. The minibus stopped after traveling 15 meters. When the police officers arrived at the scene, they found the left rear wheel still had hair tissues which they believe to belong to Tam. According to information, Tam was wearing her school sports uniform and a down jacket. Mother and daughter took the minibus from Yau Tong to Mong Kok. At around noon, the minibus arrived at Prince Edward Road West at the intersection with Embankment Road. The bus stopped to let Tam's mother get off first with her daughter's school bag. Tam followed quickly behind. But before mother and child even got on the pedestrian sidewalk, the minibus driver closed the bus door and quickly drove off. According to witnesses, Tam lost her balance and screamed, "Mommy!" Then she was swept underneath the minibus. As the minibus continued to move ahead, her head was rolled over by the left rear wheel and she lied in a pool of blood. After the accident occurred, Tam's mother, a female passenger on the bus and a female driver in a trailing BMW all witnessed what happened and respectively yelled and honked horns to get the minibus driver to brake. But by that time the bus had advanced 15 meters already and Tam was lying face down in a pool of blood. A 6-year-old school girl getting off a minibus after her mother was believed to have her down jacket caught in the minibus door and then swept underneath the minibus. Her head was then rolled over by the car wheel. Tam cried out "Mama!". When her mother turned around, she saw that her daughter had fallen on the ground and possibly rolled over by the minibus. Her mother raced after the minibus and pounded on the side. A female driver in a BMW behind the minibus witnessed the tragedy and honked the car horn to sound the alarm. The minibus was believed to have been in a hurry and did not stop until the passengers shouted at him. By that time, the minibus had already gone 12 meters. At the scene, the police checked the bus and the school girl for traces of clothing. When Tam left to school, she wore a blue down jacket and a pink scarf around her neck. In the left frame of the minibus car door, there were blue clothing tissues. On Tam's down jacket, there a thin long mark created by pressure from a hard object; on the left rear car wheel, there were pink clothing tissues. It is believed that the pink scarf had been ripped to shreds. Because it was cold yesterday, Tam wore a thick overcoat and a pink scarf. At around noon, the minibus stopped in the slow lane on Prince Edward Road West across Embankment Road. Tam's mother paid the bus fare first and got off first while holding Tam's schoolbag and another paper bag. Tam then followed. 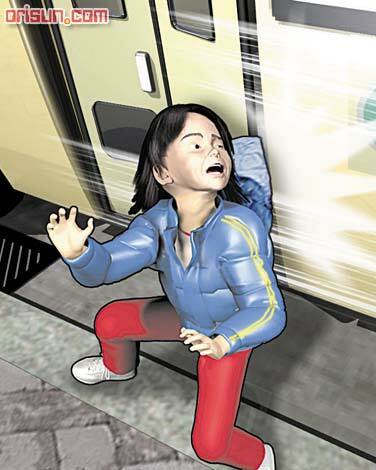 When Tam reached ground but before she got on the pedestrian sidewalk, the minibus driver was suspected of closing the door which trapped the girl's scarf. The minibus driver was also suspected of stepping on the gas without checking the status of the passengers who had gotten off. As a result, when the bus took off, the scarf became a noose that dragged the girl forward. The girl was dragged forward for a few steps, lost her balance, got swept under the minibus and had her head rolled over by the left rear wheel. According to information, the minibus driver did not realize what had happened. Several passengers on the bus screamed for him to stop and the driver in a trailing car honked the car horn to warn him. The minibus driver stopped after having gone more than 10 meters already. Ordinarily, mother and daughter get off at the Royal Plaza Hotel right after the railroad overpass. But Tam's mother saw that the minibus had stopped anyway, and therefore decided to get off earlier. She paid the fare and got off first. Tam was the last person to get off the bus. 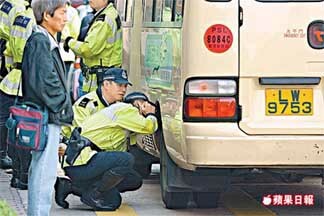 It is suspected that the bus driver was in a hurry and Tam was so small that he did not see whether she had gone clear. It is suspected that Tam wore a scarf to keep warm, and the scar was trapped by the door of the minibus. When the minibus started to move forward, Tam was dragged along and fell to the ground. She was then swept underneath the minibus and her head was rolled over by the left rear wheel. After this happened, the driver was unaware and kept on ahead. A private car driver behind saw what happened and honed the car corn. Pedestrians and minibus passengers shouted for the driver to stop. By the time that the driver braked, the minibus had already traveled 15 meters. Because the section of Prince Edward Road West next to the school is a "no stopping" zone, Tam and her mother are accustomed to get off about 500 meters before the school at the Embankment Road intersection with Prince Edward Road West. At around noon, the bus stopped at the location, the mother got off first but she did not help her daughter. Instead she let her daughter get off on her home. At the moment when Tam got off, the driver closed the door and stepped on the gas. Since it was cold yesterday, Tam's mother wrapped a pink scarf around her daughter's neck. But the pink scarf got stuck in the door. When the minibus took off, Tam was dragged to the ground. Tam's mother just a couple of steps ahead. Suddenly she heard Tam yell "Mommy!" She turned around and saw her daughter on the ground and dragged underneath the minibus. She immediately screamed and pounded on the side of the minibus. But the minibus driver was oblivious. In an instant, the left rear wheel of the rolled over Tam's head and the top half of her body. Blood was sputtering from her head. A female driver behind the minibus began to honk her horn. The minibus driver stopped 15 meters from the position where Tam was lying down. At noon yesterday, mother and daughter took a minibus from Yau Tong to Mong Kok. Because there are many minibus no-stopping zones, they got off at the Embankment Road-Prince Edward Road West intersection about 200 meters before the school. At the time, Tam's mother was carrying her daughter's school bag on her back and held a hand bag in one hand and a lunch box in the other hand. She paid the fare and got off. Tam followed. When the minibus took off, it is suspected that Tam's scarf got caught in the door. Tam's mother found her daughter being dragged along by the minibus. She was staggering and then she got dragged underneath and her head was rolled over the left rear wheel. The minibus continued for 15 meters before the driver became aware and stopped.